GAHS junior Junon Ohmura (23) dribbles the ball down the sideline during the second half of the Blue Angels 1-0 victory over Rock Hill on Thursday night in Centenary, Ohio. CENTENARY, Ohio — One can often be enough. 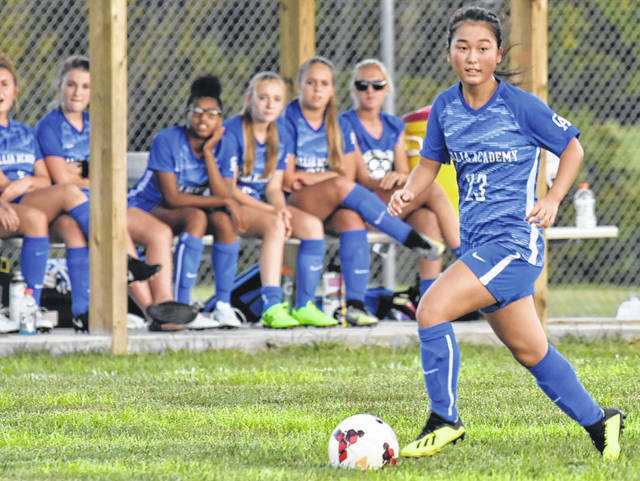 The Gallia Academy girls soccer program provided the lone goal on Thursday night en route to a 1-0 victory over visiting Rock Hill in an Ohio Valley Conference contest at Lester Field. The Blue Angels (5-1, 3-0 OVC) produced what proved to be the game-winning goal when Kyrsten Sanders scored at the 35:31 mark of the first half. GAHS senior Alexis Nickels made two saves while earning a clean sheet win in net, while Grace Stevens stopped three shots in goal for the Red and White. The Blue Angels produced a total of 11 shots in the contest, while the Redwomen were held to just two. Gallia Academy claimed a 5-2 advantage in corner kicks. Rock Hill were whistled for two fouls, while the hosts ended the contest with one. GAHS returns to action on Tuesday as it travels to face OVC foe South Point. https://www.mydailysentinel.com/wp-content/uploads/sites/14/2018/09/web1_9.8-GA-Ohmura.jpgGAHS junior Junon Ohmura (23) dribbles the ball down the sideline during the second half of the Blue Angels 1-0 victory over Rock Hill on Thursday night in Centenary, Ohio.